Not since Rice-a-Roni has the trolley car been so popular. What started as a philosophical thought experiment (first posed in the 1960s by British philosopher Philippa Foot) has become fodder for barroom chautauquas and classroom debates. It goes a little something like this: You are the conductor of a runaway trolley, and you’re headed toward five men working on the track. You have no way to stop or slow down, and you know that all five men will die. Then, you notice a side track, and by simply pulling a switch, you’ll reroute the trolley and spare the workers. However, you see another man on this side track. The worker will surely die, but this lone death will save five. Do you pull the switch? What makes the trolley problem so interesting is that it can be reframed in many ways, all essentially asking the same question: Is it better that one person dies in order to save five lives? The utilitarian gut response is usually affirmative, but the problem gets trickier as you introduce different scenarios. The darkest and most humorous of these is the fat guy on the bridge. Rather than the conductor, you and an obese stranger are on an overpass looking down at the track. In this scenario, there is no side track and no way to reroute the train away from the workers. The only way to spare their lives is to stop the trolley… and the only way to do that is by pushing the obese man off the bridge. That’s quite the game-changer. But yet, the principle question remains the same: Is it better that one dies to save five? This dilemma has moved from the classroom to cultural conscience thanks to the work of philosopher Michael J. Sandel and his book/mooc/PBS lectures on justice. This fall, two more intellectual titans offer their take on this ethical dilemma. In The Trolley Problem, or Would You Push the Fat Guy off the Bridge? : A Philosophical Conundrum, published Sept. 10, Thomas Cathcart presents the arguments before a judge and jury, albeit fictitious. 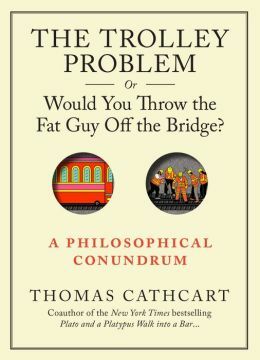 Cathcart is best known for a series of books coauthored with Daniel Klein that explains complicated philosophical ideas through jokes and anecdotes, and as with these bestsellers, like Plato and a Platypus Walk Into a Bar…, the tone is light and irreverent. Though the jests overshadow the ethics, there is some substance to the work. Ethical arguments are accompanied by short bios of their progenitors, and the introduction and conclusion put forth serious thought. That said, the jokes amount to insider baseball. The greatness of Cathcart’s other books is that they serve a general audience. The humor in The Trolley Problem, or Would You Push the Fat Guy off the Bridge? is geared toward a readership already familiar with the thought experiment. Those familiar with the work of Sandel and Foot will enjoy this short, light-hearted laugher. Those looking to explore the complexities of the dilemma should look elsewhere, get up to speed, and then dig into this trial by philosophy. At least Cathcart gives us something the others don’t (sort of): a juried decision. The final verdict? You’ll just have to read it for yourself. 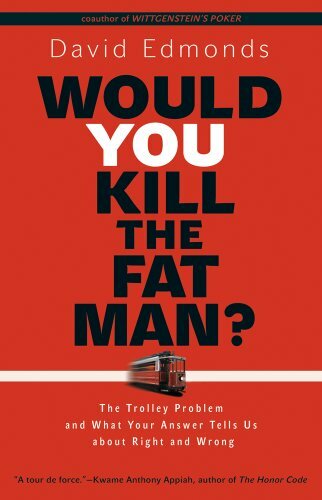 The trolley debate gets a deeper look on Oct. 6, with David Edmonds‘ Would You Kill the Fat man? : The Trolley Problem and What Your Answer Tells Us about Right and Wrong. Edmonds is co-host of one of my favorite podcasts, Philosophy Bites, which has spawned two books and brought contemporary and historical philosophical concepts to a general audience. His treatment of the trolley problem traces the history of moral philosophy and modern ethics with the entertaining flair he brings to Philosophy Bites. Though covering the same topic, these two books offer complementary takes on this complicated thought experiment. Fans of philosophy, moral inquiries or deep thinking in general will enjoy both of these fine book.